Back in 2011, the Discovery Channel aired the beer documentary How Beer Saved the World (transcript here), a film that took a look at the origins of beer and also built a case for (spoiler alert) how beer saved the world. The film fired off one fascinating beer fact after another like how beer was responsible for the start of the agricultural revolution in 9,000 B.C., or how beer built the pyramids of ancient Egypt, saved millions of lives in the Middle Ages, and how beer was to thank for inventions like the wheel, writing, math, and modern medicine, just to name a few. No doubt, the documentary boasted many a bold claim, but as a beer brewer, I was interested in one claim in particular: a significant amount of tetracycline, a broad-spectrum antibiotic, was discovered in 3,000 year-old Egyptian bones, and the source of that tetracycline was from an ancient beer recipe. But sure enough, Dr. George Armelagos, Professor of Anthropology at Emory University, proved conclusively that there was no mistake; tetracycline was in ancient bones, and in large quantities. Around 1980, Debra Martin, a grad student of biological anthropology at the University of Massachusetts, was learning how to make thin sections of archaeological bones while visiting a research laboratory at Henry Ford Hospital in Detroit, Michigan. After manually grinding down a bone fragment from a 4th century ancient Nubian mummy, Martin was preparing to view it under a standard microscope, but only a UV microscope was available. Remarkably, when Martin looked at this ancient bone section under the UV microscope, it was emitting a yellow-green fluorescence, just like tetracycline. But Armelagos and his colleagues’ work was met with skepticism, so in 2010, he teamed up with medicinal chemist Mark Nelson and after using hydrogen fluoride to first dissolve the bones, they then extracted and finally positively identified the tetracycline through chemical analysis. No question, tetracycline was definitively in the bones. Searching for the source of the tetracycline, Armelagos recreated many ancient recipes to no avail. 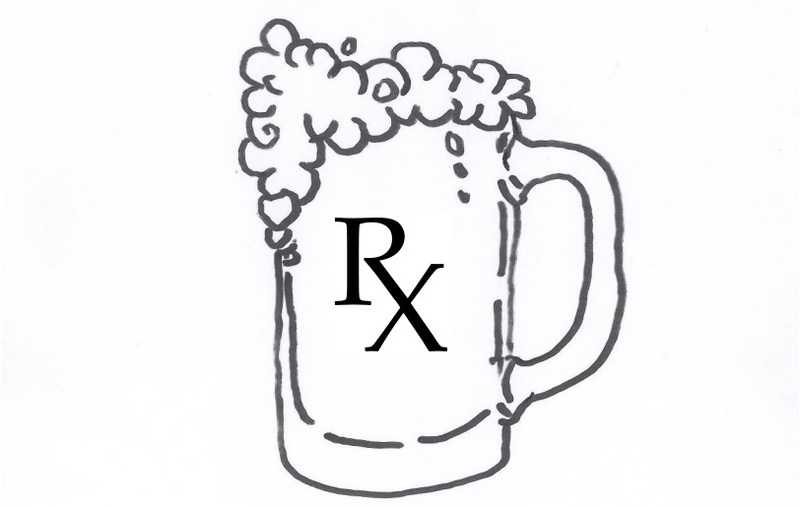 That was until he finally came across an ancient beer recipe from around that time, brewed it, and, lo and behold, the beer contained significant enough levels of tetracycline to be considered a likely candidate for the source of the antibiotic. Of course the documentary How Beer Saved the World left one big fat mystery sitting on the table: what the heck was going on with that ancient beer recipe that it not only produced antibiotics, but produced the antibiotics in such large amounts? And here’s a scary thought: if ancient brewers were somehow introducing antibiotics into their beer, is it possible that brewers today are doing the same thing and pumping us all full of tetracycline? Sure, a steady intake of antibiotics might keep us healthy in the short term, but ultimately it could also contribute to the increase of deadly antibiotic-resistant superbugs that might one day wipe mankind off the face of the Earth leading to a follow-up documentary: How Beer Destroyed the World. But before you call the FDA, let’s examine the facts. Like modern beer, the ancient antibiotic beer was made with grain. Naturally occurring tetracycline is produced by mold-like (spore-forming) bacteria called Streptomyces, which is common in soil and decaying vegetation, especially in warm arid regions like in ancient Nubia. If these antibiotic-producing bacteria were to come into contact with grain, and that grain was then used to make beer, tetracycline would be in the final product. Dr. Armelagos believes that the grains used to make the ancient beer were likely stored in mud bins, and because Streptomyces is commonly found in soil, the grains would have come into contact with the Streptomyces from the mud bins. Now, even though modern grain is frequently covered with bacteria, it is normally stored in steel silos, not in mud bins. This reduces the likelihood that modern beer would contain significant amounts of tetracycline. But the mud bin theory only explains how the grain could have been contaminated, not how it was able to produce so much tetracycline. For example, when grain covered with the antibiotic-producing bacteria was tested, there were only minimal amounts of tetracycline detected— not nearly the amount that was found in those almost 2,000 year-old bones. So what gives? But that explanation might leave some brewers scratching their heads, and here’s why: dead bacteria (Streptomyces) don’t produce tetracycline. Allow me to clarify. When making beer, malted grains are first soaked in hot water for about an hour. That hot water extracts sugars from the grain. The grain is then removed, leaving behind a kind of sugar water that brewers call “wort”. After that, the wort is typically boiled for an hour or more, and then cooled. Boiling the wort is key here because the boiling temperature would kill most bacteria, including Streptomyces. It’s only after the wort is boiled and cooled that primary fermentation takes place. In other words, if the Streptomyces bacteria are killed off during the boil, they wouldn’t survive to create any tetracycline during fermentation, certainly not the kind of levels of tetracycline found in those ancient bones. So, yes, tetracycline could survive the boil, but the Streptomyces bacteria couldn’t. And we need that Streptomyces bacteria alive and well to make it to the fermentation process in order to produce the amounts of tetracycline found in those ancient bones. Oh well- so much for our ancient antibiotic beer. Eh, except for the fact that Dr. Armelagos and his colleagues were able to reproduce the ancient beer which was teeming with tetracycline, and he’s even had some of his student do it too. The first thing you should know about ancient Egyptian beer recipes is that they are not exactly similar to how most beer is typically brewed today. For example, the process for making Egyptian beer generally began first by making bread, which probably would have been made from emmer (a kind of wheat), spelt or barely grains, and there is evidence to suggest that the grains were malted. In order to make the bread for an antibiotic beer the way the ancient Egyptians and Nubians seem to have done it, the Streptomyces-contaminated grain would go through a malting process which first begins by germinating the grain. Germinating the grain causes the starch inside the grain to be converted into sugars by enzymes which conveniently reside within the grain itself. The grain is eventually dried out which stops the germination process, otherwise the sprouting plant would use up the starches and sugars in the grain needed to make beer. The dried grain is now called malt and contains the sugars that are important for making antibiotic beer. Those sugars are important because they become a food source for the Streptomyces coating the grain to metabolize and convert into tetracycline. After the grain was dried, it was milled into flour and mixed with water to create dough. That dough was then left to rise which likely occurred as a result of exposure to naturally occurring yeast in the air. During this time, the Streptomyces that was on the grain could produce even more tetracycline from the sugars in the fermenting dough. Even if the all of the Streptomyces would have been destroyed as a result of baking the bread, the tetracycline would have already been produced and been present in bread and any beer made from bread that used Streptomyces-contaminated grain. However, Dr. Armelagos notes that the tetracycline bread was added to a broth of milled Streptomyces-contaminated malt, which would have further increased both the alcohol and tetracycline content. In fact, Armelagos’ team preformed two experiments: one in which Streptomyces was added to the dough, and one where Streptomyces was added only to the malt broth. The latter proved more successful, producing significant amounts of tetracycline. The resulting “beer” may have been strained away from the mushy bread gruel, or simply consumed together in a bowl like a mildly alcoholic lumpy, beer-y soup. So, as it turns out, the key to making ancient antibiotic beer is the presence of live Streptomyces bacteria during fermentation. And if one were trying to introduce Streptomyces into beer or bread today (for scientific purposes), it is certainly possible to find the naturally occurring antibiotic-producing bacteria under certain conditions. However, one could also probably just buy a pure culture of Streptomyces online and add it along with yeast early in the fermentation process (although personally, I generally prefer my beer antibiotic-free). To echo the late Paul Harvey: and now you know the rest of the story. Hi, I’m Dan: Beer Editor for Beer Syndicate, Beer and Drinking Blogger, Gold Medal-Winning Homebrewer, Beer Reviewer, AHA Member, Beer Judge, Shameless Beer Promoter, and Beer Traveler. 1. Cartwright, A. C. (n.d.). The British Pharmacopoeia, 1864 to 2014: Medicines, International Standards, and the State (p. 193). 4. Nelson, M., Hillen, W., & Greenwald, R. A. (2001). Tetracyclines in Biology, Chemistry, and Medicine (p. 219). Basel: Birkhauser Verlag. 9. W.J. Darby, P. Ghalioungi and L. Grivetti, Foor: The Gift of Osiris, 2 volumes, Academic Press, London, 1977.